This holiday cottage is in the perfect location for exploring it all! Conveniently located just minutes from the A1, but far enough away to maintain the peace and tranquillity of a rural location, it’s an ideal base for getting about. If history is what you are looking for, the Scottish Borders is steeped in it. With archaeological sites and museums there is plenty to do to while away the time. Grand aristocratic mansions and castles litter the landscape, thrown up in the defence against the English, with Thirlestane, Floors and Tantallon within easy reach. For the more adventurous, there are a host of leisure activities in the surrounding area. With East Lothian and the Berwickshire coastline on the doorstep the opportunities are endless. Award winning golf courses such as North Berwick and Muirfield make this the ideal holiday destination for serious golfers. The stretch of coastline at Pease Bay up to Coldingham provides some of the best surf Scotland has to offer. With a local surf school open all year round it’s certainly not for the faint hearted! Without a doubt there are some serious walking opportunities given that the cottage gives onto the very end of the Southern Upland Way at Pease Dean just a few minutes walk from the front door. The John Muir way also provides a network of walks through East Lothian snaking across the beautiful countryside and coastline. 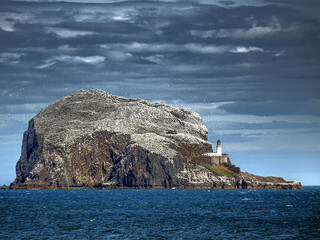 And for those bird watchers out there, Bass Rock off the coast at North Berwick is famous for nesting sea birds. The sea bird centre provides a viewing platform, and live web cam footage. 20 miles south is Berwick-upon-Tweed, the Georgian market town which retains much of its quaint charm. The old city ramparts are still in existence today and provide a great walking opportunity. It also has a large and very popular beach within easy reach of the town, and a range of shops and cafes. Also worth a visit are St Abbs, North Berwick, Eyemouth and Dunbar. And finally, Edinburgh boasts everything a capital city should have, and if this is your first visit to Scotland then it’s an absolute must. You will find a plethora of bars and restaurants, shopping in the famous Princes Street and tourist sights including the Castle and Royal Mile, and just 40 miles away it’s an easy day trip. Trains leave from Dunbar every hour, meaning you have no excuses for leaving if off your itinerary!! With all this to do you will certainly to need to come back for another visit! !